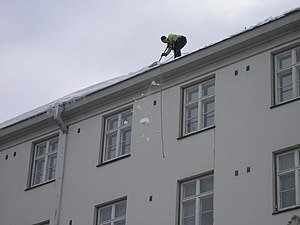 English: Snow being dropped from roof. As we all know owning a house is the best thing can anyone would want instead of renting of course. Only difference is that you do not have a landlord to call if there is a problem. What is the most important part of a house? Your roof of course. What can you do to protect your roof? For starters, have your roof inspected every year before winter to make sure it will survive the heavy snow fall, ice build ups and of course heavy rain during the spring. The roof is designed to protect you against whatever the mother nature has to offer. During winter months all the snow parks on top of your roof and waits for the sunny days to melt. When it starts to melt it could lead to major water damage in your attic, on your walls, even on your floors. What happens is that when the surface of your roof turns in to ice and it gets thicker and thicker. Once the melting occurs water is looking for a path to make its way down. If the slope on your roof is 4/12 or 6/12 pitch, you may be facing water damage or not yet. When the slope of the roof is not providing a path for the water to escape, it finds its way down in to your bedroom, living room or kitchen. When the water starts to build up it works its way going towards the peak of the roof. It creeps under the shingles or metal penal. It happens most of the time to “bungalows” where the slope is 4/12 or 6/12. It can happen to any home with this type of pitch. How can you prevent this from happening? The answer is simple. *First of all have your gutters cleaned out before winter so that ice doesn’t build up inside your gutters. *Have your roof inspected before winter. *Get all the valleys, flashing’s and all the exposed nails caulked. *If snow is starting to build up, get it removed by a professional. * Get all the snow removed before Feb/21. If all the necessary steps are in place, your house is protected from whatever the mother nature has to offer. We are here to assist you with all your roofing, siding, foundation and snow removal services in the cities of Ottawa, Nepean, Barrhaven, Kanata, Stittsville, Orleans, Manotick and Greely Ontario. Call today for you free consultation or quotes and estimates. It is worth the money you’ll spend on inspection, caulking or roof-top snow removal. It could cost you up to thousands of dollars to get all the damage repaired. Never wait for it to happen. Do your homework on time and you’ll be okay.